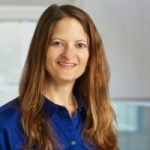 As Chris Hemedinger has written in several of his blog posts, SAS Enterprise Guide 4.3 has many more formatting options. I particularily enjoyed the 'CTRL-i' option to reformat SAS code with indents and carriage returns to make my programs even more readable. The 'CTRL-e' and 'CTRL-SHIFT-e' keyboard shortcuts are also useful at least for those of us with code errors. These two keystrokes move you through the log file from one error to the next ('CTRL-e') or back to the last error ('CTRL-SHIFT-e'). Another item that I greatly appreciate is the programming window style customizations. 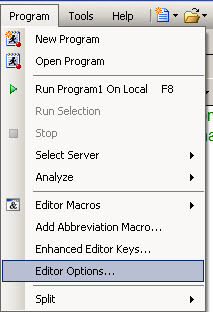 Click on 'Program' -> 'Editor Options' to get to the option window. 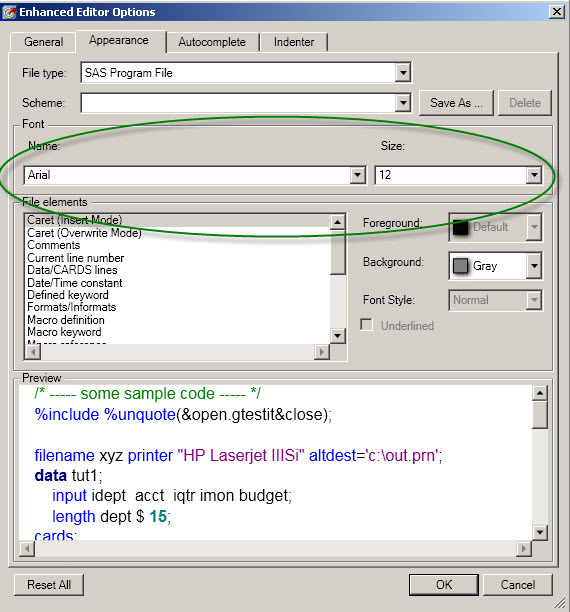 Then you can change the font, font size, as well as the individual program element background colors.